When I went on GAPS, the big difference in making yogurt is that it needs to be cultured for 24 hours to be sure all the lactose is broken down. I expect this also increases the probiotics quite a bit. And I'd expect the yogurt to be more tart. My "normal" crockpot method didn't work anymore because the milk didn't stay warm enough long enough. But my new method, a thermos, worked better even without being on GAPS. I had the simplest method in the world. I put 4 cups raw milk in one quart jar, 3 1/2 cups in a second, stuck them in the crockpot with a thermometer, poured water around them, and ran the crockpot on high until it was between 100-110 degrees Farenheit. I would usually start this process before I started dinner, and it'd be warm enough by the time I was doing dishes to proceed. 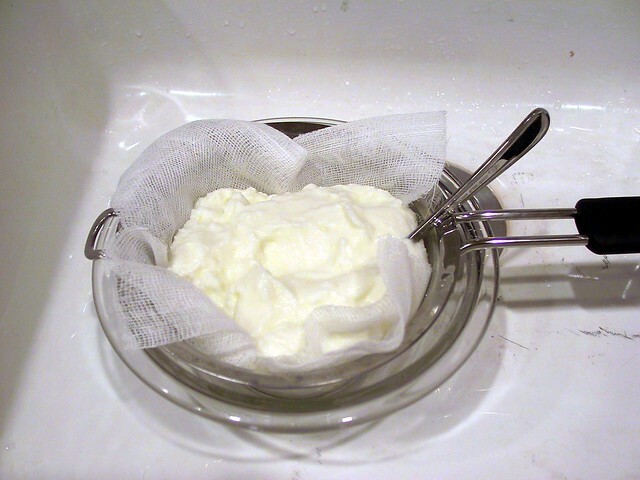 So then I'd remove a half cup of milk from the 4-cup jar, mix it up in a bowl with 1/4 cup yogurt from my previous batch (if it was less than about 2 weeks old) or from a store-bought container of plain Dannon. Then I'd turn the crockpot off, cover it, and throw a blanket around it. By morning, there'd be yogurt, and I'd cap the jars, and put them in the fridge. I liked this method because over the years I have learned to despise one-use kitchen appliances; I already have a crockpot, I use it a lot, and it works just fine. Because I do not heat the milk enough to kill bacteria, preferring to make raw milk yogurt over having a standard consistency, sometimes the yogurt was thinner than other times. I'd drain it with a method similar to the image if needed to thicken it. This method doesn't work for a 24 hour ferment unless it's summertime... and today, in August, it barely hit 70 degrees here. The yogurt doesn't stay at the right temperature to make the L. bulgaricus and S. thermophillus happy to grow, so who knows what winds up growing in there? There are cultures that work at room temperature (which begs the question if they'd work in my kitchen in winter, when it's rarely over 50 degrees except when the oven is on). It's just that the idea of buying a culture again and again annoys me. So my goal was to keep the ordinary bacteria happy rather than buy bacteria that'd be happy. It occurred to me that what I needed was a wide-mouth thermos. I like this idea better than a yogurt-maker, because a thermos is a more flexible item to own, it can do a number of things, including cooking grains with almost no energy input. I did a bunch of research and decided on this guy. This is supposedly 48 oz which is 6 cups. However, if you actually try to put 5 1/2 cups in there, you can't put the lid on without spilling! So practically, it holds about 5 cups warm milk. I fill the thermos with hot tap water to preheat it. I warm the milk in a saucepan to the same 100-110 so it stays raw, add 2-3 TB yogurt and mix to dissolve, then dump the warm water from the thermos and add the milk/yogurt mixture. 24 hours later, it's still very warm, and a bit tarter than my old method. are mud pies a superfood?